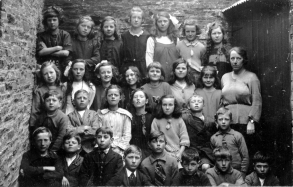 This page only contains the record of one St Neot Family, we have stories of more in the History Archive. 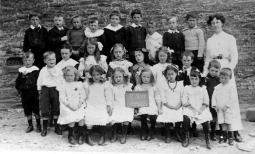 Miss Arthur with her Class in 1911 at St Neot School Miss Arthur married Mr Bruton who was Cannon Majendie's driver mentioned in the Alice Lillas Roose (Lobb) memories of St Neot. 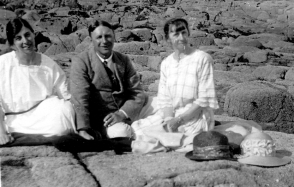 Mr Bruton and Miss Arthur (right) on the beach. They got married and left the village in 1920. Cannon Majendie took Mr Bruton to France with him in 1909 when he bought a new car. 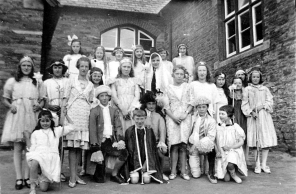 I am sending some photographs which I hope will be a useful contribution to the memorabilia for the St Neot Old School Celebration. 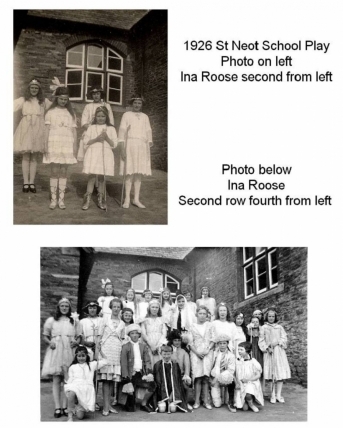 My late sister Ina, my late brother Ralph and I all attended St Neot School until 1927 when the family emigrated to Canada. My late mother Lillas Roose (nee Lobb) also attended the school. 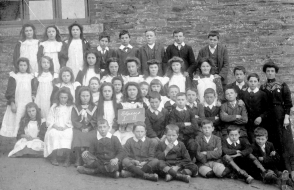 She and her brother Arthur are both in the 1906 class picture. Since Alec Lobb is my first cousin I know that he and Margaret would be pleased to see that these pictures got into the appropriate hands. 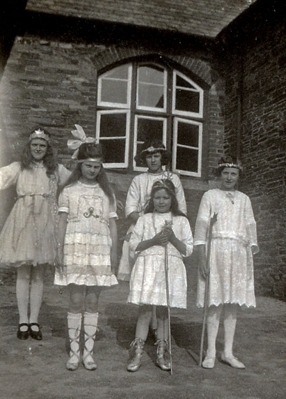 When I look at the pictures it occurs to me that the school provided many activities for the pupils at that time. Both my sister and my mother were very active during their years at the school. I was a pupil there for only two years but did get to sing a solo at the Christmas Concert in the Institute. I wish you every success with the exhibition and wish I could be there to share it with everyone. I am speaking to you from Toronto Canada on February 1980. I was born at Newton Cottage St Neot on June 2nd 1894 My parents were Elizabeth and Fred Lobb arrived back in England from the U.S. in the autumn of 1891 after an absence of 5 years. During that time they met and married in Ironwood, Michigan USA and returned to St Neot in 1891. Two of their children, Winifred and Charlie, were born in the USA, I was born on June 2nd 1894, Myrtle was born Feb 1892, Arthur was born in 1896 and Fred in 1898. In all 3 boys and 3 girls. 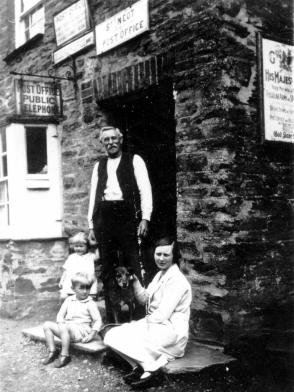 They rented and settled into Newton Cottage, now owned by Gladys and Harold Sowden. We lived there until 1910. My father worked at the slate quarry later the quarry was renamed Carnglaze by William Arthur Pascoe, father was a miner and worked underground. Edwin Lobb his father worked in the shed splitting and planing the large slabs of stone and he was a master craftsman. My grandfathers’ brother Erwin looked after the explosives. When the quarry was closed down they went to work at Treveddoe mine at Warleggan, where they stayed for many years. Walking was the only way of getting there, also they had to climb up and down the ladders to get to the mine. Later on my fathers heart condition stopped him from doing this. He went to work at the clay works before becoming the village Post master for 30 years. In addition to this he kept up his duties on the County Council, the Parish Council, the School Board and as a Lay Preacher in the Methodist Church. He was always in great demand. When the clay works started up at Parsons Parks they built a power house in Hammett Wood, my father worked for the engineer who installed the machinery and learnt how to work it. He left the village each morning except Sundays at about 4am and walked up to Hammett Wood as the water had to be pumped out of the shafts at Parsons Park before the men could start work, they came in at 6am. On a Saturday or holiday some of us children would often walk up with a hot dinner for him and stay and walk home with him after work. It was a very beautiful wood but very lonesome still we enjoyed visiting there. 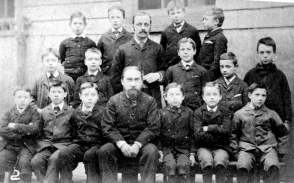 My father attended a private school for boys at Dobwalls when he was a child but he was the only child to do so. Myself, my sisters and my brothers all attended the St Neot School. 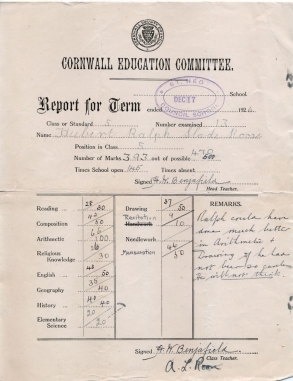 There was no secondary school until much later but there was a private school for boys at Liskeard called Wadhams School, if you could afford it. I remember Willie Perry of Newhouse, Frank Arthur of Lestow and Frank Adams who later married Mattie Rowe attending there. St Neot School was known as St Neot Board School when I started going there and I think it was run by the Church of England. 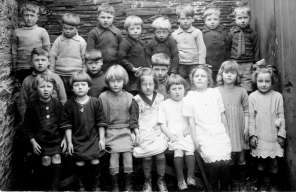 Later it was St Neot Council School and the Church had less to do with the management of it. While it was a board school the boys were separated from the girls, there was a Head Master and Head Mistress, after it became a council school it was mixed and boys and girls studied in the same classrooms. Only one of the teaching staff was a certified Teacher, the others being local people or Article 68. 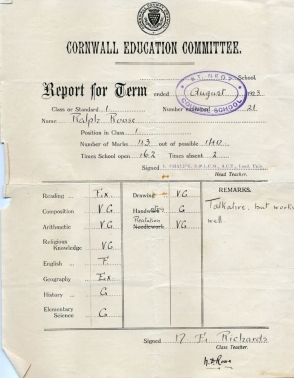 I don’t recall how or when they started the examinations for the secondary school but the exams were taken at Liskeard later on and I think Lily Kent neé Rowe was the first to win and my brother Fred later on. The other pupils paid and so the books and everything my brother used were marked Scholar and he would be referred to as such – class distinction I guess! he rode a bicycle to school. 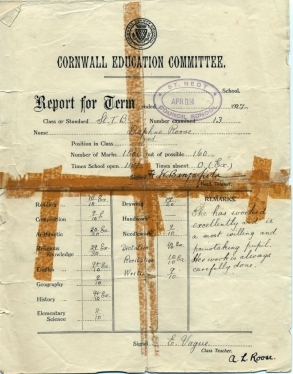 He graduated at 16 years of age and went to Plymouth to take a week long examination for the Junior Civil Service. This he passed and went to London and worked in the Post Office Savings Bank until retirement at which time he returned to St Neot and where he died in 1972. He had served in the Navy in World War I as a wireless operator which would have been his 2nd choice of career if he had failed the Civil Service Senior examination taken after he had worked a while. When I attended St Neot School we were taken on nature study walks and wrote compositions about all the flowers and mosses etc. that we had seen. Being raised in the country we were very knowledgeable on such things anyway. We collected many things which grew in the hedges, we always knew what we could eat and what not to and we sure ate many things from the hedges. Naturally we picked all flowers in season and carried them home to mother. Best of all in school I liked the singing class maybe because I was a star turn from infants onwards when it came to singing. I don’t remember thinking about amusing ourselves, we all had odd jobs to do in the home and we all had a small piece of garden to grow flowers. I used to spend time with my grandmother in the village she was a dress maker and milliner and showed me so many things about hats such as the way to sew ostrich feathers, how to curl them when the damp weather took the curl out and there was always something to do. The Church and Chapel played a major part in our lives, even the belfry then as there was always someone learning to ring the bells. On August Bank Holiday there was a Band of Hope Tea held on the football pitch on the downs, organised by Tredinnick and Bridge End Chapels. They always hired a very good band, often Bugle or Stenalees. That band was a treat for everyone and drew lots of people. The band and the children of the village would line up in Bush Hill just below Jimmers and parade through the village and back, it really was something with banners flying and excited children would really march to that lovely band. Church Festival was held on the 1st Sunday and Monday in July, there was usually a band from Liskeard for that and it was also greatly enjoyed. After we would get to the downs, we walked up Bush Hill naturally, it was too steep to keep in line going up there. We would get up there the tables would all be set, and the water would be boiling, they’d have 3 huge things of water boiling. While the ladies put the food out on the table the kids would run around and play and there would be some sports for them. There would be a large cutting up table, the women that cut up the food brought their own knives etc. The women who waited took their own dishes crockery ware, tea pots, milk jugs, tea towels and dishes to wash up in every thing they used they carried. Ours went from Newton, a long jaunt to carry all that. The tea was always a big success because they had very good food, it was from one of the bakeries in Liskeard, lots of kinds of cakes and splits well buttered, and bread and butter, it was really a nice. Tea on the downs it was really enjoyed. Well after the tea was then over there was always a Temperance meeting after that. The young people would congregate and form a large ring and play French Tag. Now that’s when the young couples lined up to go off together for the evening. You would line up there and gradually the couples would move off and go away but it was a lot of fun. That’s where I met my husband, we were both twelve at the time. That’s the first time I had seen him, I knew his two brothers. As kids we attended all the weddings and funerals, I guess to see all the people. Chapel Christenings were done at the home with two or three of the kids were done at once. I never saw a Church christening. When we walked from the hedges we would pick and eat what we called sour sabs, a green leaf which left a very pleasant taste in your mouth. We also ate young leaves from the thorn bushes and beech leaves, pulling the stem of grass to chew the tender end of it was pure pleasure and of course we gathered wild flowers. There were often visiting concert people come around and we all went to Political meetings. I think the young folk loved politics best of all, the meeting was so exciting, they were held in the Institute. This was in the days long before the radio and TV. I well remember how the children would argue politics at school and lots wore ribbons for one side or the other during elections. The Tories were red white and blue, while the Liberals were orange and blue. The main theme of the election in that era, while I was a student, was free trade and protection. The men always talked a lot about Parliament when they got together, my father was keenly interested in all governing bodies but after he became Post Master he had to give up all Politics as a Government man was not allowed to have anything to do with it. The only girl I knew who earned any money was Ellen Parry, she used to carry milk from in the diary at Newhouse to Kitto’s at Ivy Crag each morning and later on also to Mrs Chalice. She also wrote letters for an old lady called Mrs Burnett who lived in a cottage at Newhouse. I don’t know how many pennies she got but on Fridays she always brought a pennies worth of sweets to school and was very generous with them. Most children just helped around the home, I don’t know of anyone who had an allowance. Children left school at 14 and went to work. I don’t think the cottagers visited much but the farmers had horses and traps and were able to move about more and visit much more. Our family did not visit much as we had no relations living near by and if we went anywhere we had to walk. To go to Plymouth one walked to the railway station at Doublebois to get the train. The Bridge End Sunday School outing was a big event once a year. We had two charabancs and they were pulled by four horses all rented from Truscotts at Liskeard, Invariably we had the same drivers so that we were like a big happy family. Usually we went to Looe where a Sunday School room was rented for the day for our convenience. We carried our food but there was always a lady there that had everything ready. The tables were laid out with table clothes and dishes and there would be hot water provided and these ladies all washed the dishes etc afterwards. So mothers would get their baskets, and each one provided its own, we didn’t mix the food, and we would have pasties as a rule with probably a piece of cake after. Then everything was left in the room while we looked around the town, went boating or the more daring of us went for a swim. Those were the only times I saw horses go into the sea and swim but those horses always did. I did not like the boat rides as I was always afraid of water. Before we left for the return journey we would have tea and then pack up everything and off we would come home. When we got to Policeman Hill as we started to go down we would all start singing and keep it up until we disembarked outside the Carlyon Arms. Everyone there could sing and it used to sound so good, our song was Home Sweet Home. Bicycles were coming in about that time, several boys had a bike and used to ride miles on a Sunday. If we shopped we usually walked to Liskeard, although after we lived in the village we would walk to Doublebois, take the train, walk up from Liskeard station to the town centre. We would go to Plymouth once a year by train on a Thursday as fares were cheaper, half a crown return on the market train. Yes I well remember the first motor car, Canon Majandy went to France to buy it and his valet Burt Bruton went to learn to drive and do running repairs, the nearest garage then was Truro and in those days that was a long way. It was a real event in the village. On Sunday afternoons when Canon Majandy went to Ley to preach he would take a load of children along. The only stipulation was that they had to attend the Church service but they went and loved it. There was no windscreen on the car and it had large brass laps up front and such beautiful sheepskin rugs to tuck around you to keep out the cold. I also remember the first telephone being installed in the post office just before my father became the Post Master, that would be maybe 1905. There was only one newspaper in the village and that was for the Institute. When it was a day old Miss Arthur who took school used to pick it up at half price and take it home to Lestow for them to read. Of course we had the Cornish Times on Saturdays. There were quite a number of businesses around the village. The blacksmiths shop was a very busy place. My great Uncle John Olliver of Cott was the smith and my two Uncles, Charlie and John Thomas Lobb learned the trade with him. Charlie helped put the railing in around the school playground before they left for America in the middle 1880’s, where both boys turned to horse shoeing. I remember John Lawry there and he always had a hired man, it was heavy work and they worked long hours. It was quite interesting to watch from the post office window when they were binding wheels or shoeing colts. He used to mend farm implements in general and did most anything where iron was used. Village men would congregate there and would give a hand helping like blowing the fire. The smith made all the horse shoes and the hoops for binding the wheels. I think it was a highly skilled trade. There was also a blacksmiths shop at Ley run by Eddie Kent and one at Treverbyn by the Wiltons. There were two carpenters shops, one run by old Mr Northcott and his son Phillip and located by the end of the bridge opposite Carlyon Arms and the other by Tommy Northcott up by the London Inn. Later on after the death of father, Phillip went farming up Back Court and Tommy moved into their shop and the house was much more roomier for Tommy’s growing family. There was also a carpenters shop up at Ley. The Mill was also an important and a very busy place, It prospered under Mr Wilcox, his nephew lived with him and drove the Mill cart which was pulled by a very beautiful grey carthorse. The horse was always well groomed and the boy was very handsome, it was a good advert. Mill work was also very heavy work although Mr Wilcox used to tell us there was a knack to handling the bolt of grain. The school children often went in when the mill was working to watch, it was very interesting. There was also a mill at Panters Bridge and of course one at Treverbyn. There were two butchers shops, Cawrse at West Lewarne did all of their own slaughtering up there and brought their meat to the village on Fridays to a shop now gone by the London Inn, perched against the Churchyard wall. Mr Horace Grylls referred to the shop once as the synagogue and it was often referred to as such by the older people. It was indeed a ramshackle place built of galvanised with one door opening onto the road from the higher end and the other on the incline towards the pub. The father whom we called Butcher Cawrse, was I presume a butcher, and was followed by his youngest son Charlie. Uncle John Olliver stole the business from him and set up a shop in Cott yard, here all the slaughtering was done. Later his son Julius took over the shop and Aunt Phillipa helped out in the shop, she was very well liked. On Thursdays, the slaughtering day, we would buy “liver and bits” The bits consisted of the skirt steak cut up. The basins for this would be lined up on the table with the pennies in them so that she knew how much to put in to each basin. Julius was not very good for the morning so often there would be children waiting there for liver and bits and we would lean on the wall separating the yard from the living quarters and watch the proceedings. Mr Oliver Bligh always came in from across the road to help pull the carcass up after slaughter because he was such a strong man. On Tuesdays there would be sheep, that was two days a week for fresh meat. The fish man came often, he would meet the boats when they came in from a nights fishing and be around very soon after. Mr Bligh had a shoe making shop across the road from Cott yard, lots of people had shoes made to measure and of course repair work done. Mr Axworthy had another shoe repair shop where the Co-op store was later on. After he died a Mr Parken who had worked for him opened a shop up Tripp Hill in what is now Frank Finch’s home. My father became Post Master in the early 1900’s. He rented two rooms in Grandfathers house which was next to the blacksmiths shop. One room, the parlour, became the Post Office, while the room above was for my sister and myself to sleep in since someone had to sleep on the premises in those days, this was because the only phone for miles around was located in the Post Office. My sister and I worked in the Office and we got to know so many people. The doctors and the vets would always come in for any messages and also call their homes from there for any further messages. We opened the Post Office at 7.30am when the mail drove in from Liskeard. We sorted the mail and sent the three mail men out on their rounds. Mr Sam Baron, the driver from Liskeard would put the horse in the stable and feed it and then he was ready to deliver the village mail. We closed at 8pm and would then have to go over the accounts so that we got out about 8.30pm. On Sundays on account of the phone we had to be there until about 10.00am. The only day we had off was Good Friday and that was like a Sunday. Christmas day we had to wait till all the mail men had finished their rounds which would be about 2 – 2.30pm before closing. We looked after all of the telegrams for the village, delivering them on foot no matter where – or really for the parish. The only tradesmen to call were the clothing outriders from the big stores, what we would call today travelling salesmen I suppose. Marshall’s from Bodmin, West from West in Bodmin, they would come driving a horse and trap. They would come and take orders and then they would send the goods and when they came about two or three or four weeks later they would pick up the money for that. Some years later Mr Piper came from Liskeard on a motor bike. On the Telegram business we used to walk for two and a half miles we would get 9d, if three miles the people getting the telegram had to pay 3d and we would get 1/- but some of the walks seemed very long. The General Stores in the village was Anna Opies up where Leonard Northcott lived, that was quite a store because she sold everything you could think of, even legal drugs. You could get there what you couldn’t get anywhere else. She was a funny little woman, and had little short finger curls dangling round her neck. Mr Opie had a few cows, they had a dairy and also played the organ in the Weslian Chapel. He also did dentistry. They’d take a kitchen chair outside on the cobbles, Mr Opie performed to pull the teeth and Annie would hold the patients head and anybody in the road could stop and watch the performance. No body got anything wrong with them, they never got any infection. Then there was Freddie Keast from Pensilva came round with a van. He went from Pensilva so far as Mount he sold all kinds of things, he also bought chicken on the way and had them on a thing at the back. Then there was the Co-op store of course. The first Co-op store was next door to the Mill where the Cash Stores was later. My grandfather was the manager of that I guess but his daughters ran it. After that the Co-op got built across the street, after old Mr Axworthy died. After the Co-op moved across the road and the business in Liskeard got bigger they used to send a baker out with bread twice a week and we used to pick it up from the store. They also delivered goods once in four weeks. They had different rounds to go, they used to deliver coal and a months supply of groceries to people. I remember when we had to buy “barme”, couldn’t get yeast, that hadn’t come into fashion yet, we used to go down to get it from Lampen Terrace and buy it from an old lady called Mrs Boundy. I think she made it but I don’t know what of. Mother used to make all of our clothes quite often, she used to get clothes from our Pensilva cousins and remake them for us. She used to rip it all, turn it and make very good clothes for us because she was a very good needle woman. We always wore pinafores to keep the dresses clean they were usually made of a pretty print but on Sundays we had a fine muslin with a lot of lace trim, these were usually bought from a store and given as gifts. We wore boots with hob nails although for Sundays there would be a pair without nails. Our underwear was made of calico, rather bulky and not too easy to launder. A chemise cut rather long with embroidery trim on neck and armholes, and then the drawers which were knee length, pleated into a band at the top which buttoned at the side or back, these were nicely trimmed with embroidery or lace at the knee. When we got to about 14 we wore a corset over the chemise and on top of that a jacket bodice made of flannelette. This was a fitted bodice with three quarter length sleeves and so nice and warm, but how we appreciated the change to combination of knitted wool and cotton and so much less to handle. 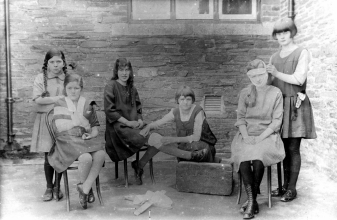 We always wore hand knitted stockings in black wool and when the feet were beyond darning mother would knit new heels and feet onto the old legs. I don’t think there was ever a time when there was no stockings on the needles. Mother bought the yarn by the pound. After we left school we wore cashmere stockings with a corsellette, that was a great thing. Hats in our early teen years were really something to behold, quite large, well trimmed with flowers and ribbons and something to balance on the head when the wind was blowing hard. The older girls wore face veils of different colours and I think that they helped to keep the hats on and the hair tidy. After we started to work at the post office we had our dresses made at Marshall’s of Bodmin and these were worn quite long. We wore boots of nice fine leather and often in the summer we had a pair of shoes but they were not good for walking on the rough roads. We all wore long hair then and in that English climate it was hard to look after. My sisters and I would braid our hair in four braids to go to bed because in that way it was much easier to handle in the morning. After school days we altered the hair style and either had it tied back or made a braid and wore a rather large bow. One at the bottom that had the hair tied into it in a way to keep the bow from falling off or being pulled off and the other was threaded through the hair above the braid to pull in the back of the head. My bows were always black in fairly wide silk ribbon. When one reached 16 or 17 you did your hair up in a bun at the back or top of your head as you were now considered grown up. We did not have afternoons for courting. The boys were usually from Mount and they would be waiting outside somewhere when the Church and Chapel came out from the Sunday services. We would go for a walk usually up around the Downs. That was a favourite walk with Myrtle and me, that or up to Tremaddock bridge up around by Trevenna and down to Bowling Green and back by Linkindale, Wemm shaft and then down to the village. The boys never came to the home, my parents didn’t allow anybody to come after us girls. They were never in the home before we were married. I knew Trenant Chapel well, both Myrtle and I were often asked to come out and help sing in the choir at all special occasions. It was a lovely walk out to Trenant and the Chapel was just lovely. It was well kept and very well attended with people from Draynes and all the farms around Treverbyn. Mabel Bowden whose father farmed lower Trenant was the organist and she was a very good singer. People would walk to the Chapel for the service and home again in the summer time for a night outing. There was a headstone in the corner by the road like a small obelisk for a Mr Eva whose daughter I knew quite well. Actually I knew several people buried in that little cemetery, such a peaceful little spot Trenant. I have lovely memories of that place and the nice people who attended the Chapel. I know the walk down by the river but I have only been on parts of it as I never cared for the woodland walks like the open moor. Yes I remember Treverbyn Mill when it was a very busy place. The Miller was called Guvert and his daughter married Fred Pearce of Taphouse. The mill and every place surrounding it was always kept so well, just swept and dusted like each day. We often went down there for a walk and also into Killham by the riverside. We often took telegrams into Killham when some company was looking for tin there just before the First World War. There were footpaths everywhere and well used for it saved a lot of walking to take a short cut, but I must say we were very happy people in that era and I never remember anyone feeling let down because some had more of this worlds goods than another. I have enjoyed making this tape very much and I hope that in some way you’ll get what you’re looking for for your records because that was a life I look back on as being very wonderful. I had a wonderful Mother who knew how to look after children and she used to read to us lot and taught us to read and taught us to speak nicely and all kinds of things like that. When you get older you remember that. It really has been a pleasure doing this and I hope you’ll benefit from some of the things I have said. All above recorded as father Frederick Lobb of Newton. * error in school register which gave his date of birth as 1888 and it should have been 1898, entry 550 in register.